Hope This Helps You: Fish & Co.
A friend was chosen for the Yehey and Fish & Co. Plating Event for Bloggers last Thursday. Unfortunately, she had to back out at the last minute and referred me instead. So I found myself with 19 other bloggers at Fish & Co. at Shangri-la Mall. Turned out, some of them were bloggers I met at the spa event a month ago. One is a Berks friend and another was a N@Wie Mom. But the best thing was being teamed up with competitive go-getters who made the contest really challenging and fun. We were split in four teams, representing fish fillet dish flavors that the restaurant offers: Malaysia, India, Japan and Philadelphia. 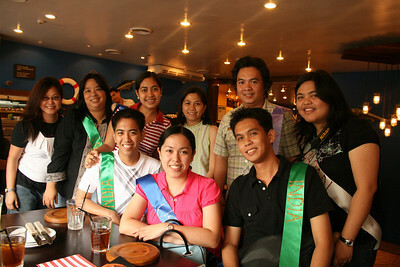 I was part of Team Philadelphia of the blue sash and travel/dining teammates. 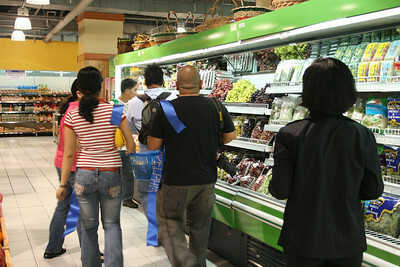 We were given P500 each and a list of ingredients to buy. I forget now if we were given 15 or 30 minutes to shop. The first team to get back to the resto was given prizes (we were first!) 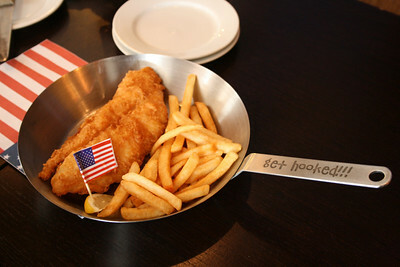 but the real task was to plate fish and chips according to the country of inspiration. Melo, a sef-proclaimed foodie and OC plater (is there such a word?) took charge. 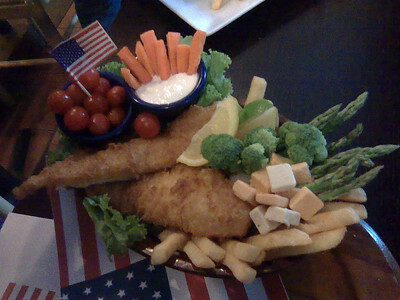 We asked for a basket and proceeded to just surround the fish and fries with the healthy veggies and colorful cheese we bought. We were the first to finish plating as well. 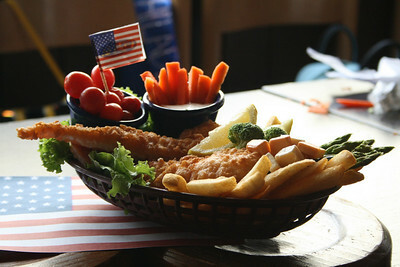 We called ours Philly Fish Steak, inspired by the Philly Cheese steak ingredients of cheese, onions, lettuce and tomatoes. The Other groups were just as inspired and prepared. Unfortunately for them, the judges decided that ours was still the best! Maybe because it's the most realistic and doable presentation of all. We each were awarded P500 Fish & Co. GCs. The worst thing about the event though is me forgetting to charge my cam batteries. I ended up missing out on a lot of photo opportunities. Needless to say, we were also treated to Fish & Co. treats. 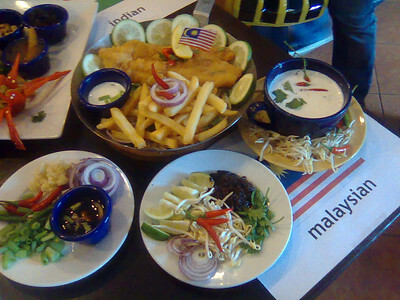 I actually really loved the fish fillet that's Malaysia-inspired (they have this platter where you can get all 4 flavors, fries and some veggies for P700 I think). It's spicy but not overly so. 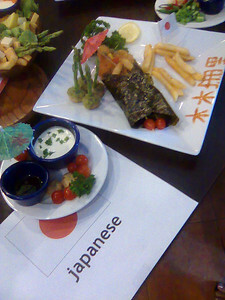 The India one has curry while the Japan one is wrapped in nori (seaweed wrap?) before being fried. Since we didn't order any other dish but went straight for the dessert options, I can't really say much about their other offerings. 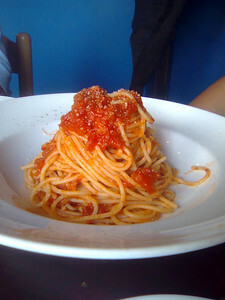 But neighboring bloggers eating their hearts out seem to really enjoy what they ordered. And mind you, the desserts WERE really treats! 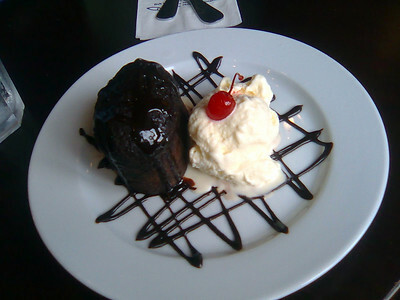 I had the hot fudge chocolate cake (P195) and I really loved the presentation, the portion (enough for two!) and the taste (the vanilla ice cream was really creamy and the cake was really moist and rich without being irritatingly sweet). Other desserts like tiramisu and the fruit something were also invitingly presented that it would really be hard to convince yourself that you're not indulging when you order them. Fish & Co. is true to their word... they do not offer good food, what they offer is a great dining experience! nice to meet you..finally we meet! !